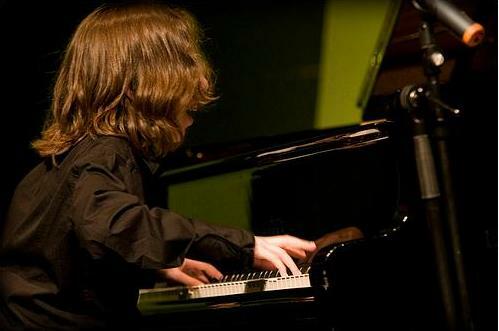 The jazz club at the Kitano Hotel on Park Avenue has a schedule of fine performers and this week featured child prodigy Gadi Lehavi on the piano. It was a remarkable scenario. Gadi is only 16 years old, and to see his bag and jacket thrown on the floor next to the Steinway, was as though he had just rushed in from school and couldn’t wait to get to the keyboard. He plays jazz, complicated pieces, music that requires crossing his hands from treble to bass and delicate pedal work. And yet he played without sheet music. Between each piece he would reference an ipad for the next, but apart from that he played perfectly naturally, as though he were the music. It was quite extraordinary. At times it seemed as though he didn’t even have to think, he looked at the audience and around the room while his hands played on. Then he would get into the groove, rocking and tapping with a calm familiarity, as though he had been playing for years. Well, he has been playing for years, but Gadi is still only 16 years old! The curator of the jazz schedule obviously has a skill in compiling the Kitano’s lineup of artists, because I am sure the next time I see Gadi’s name he will be headlining at Carnegie Hall. He has played at the Village Vanguard with Ravi Coltrane and this week will also be playing at the Blue Note downtown. He very proudly told me about his trip to Australia last year. But the real bragging rights were with his father, there almost didn’t need to be anyone else in the room such was the measure of his pride. This entry was posted in music and tagged Gadi Lehavi, Kitano Hotel. Bookmark the permalink.